On Sunday, for Easter, we explored Jesus first words he says after his resurrection. For the past 6 week’s we’ve looked at what Jesus said before he died. Now we wanted to look at what he says when he lives. The key thing to notice first off is that words have power. They can both heal, or tear down. They can give life, or create death. Words have a power, a weight, an energy to them. And Jesus’ words especially have a power to them. So the disciples are sitting in fear. They are filled with fear and worry and anxiety. Shame is covering their hearts, and guilt is seeping through their souls. They are hiding in a room and Jesus shows up. And before we jump to Jesus words, we need to first recognize one clear thing: for the disciples Jesus showing up would not seem like a good thing. And at first that statement might seem funny – you might have even re-read it – but its true. We know that Jesus comes with grace, and forgiveness – but the disciples didn’t. Remember at this point they are God-betrayers, God-abandoners, and God-deserters. That’s who they are. They are not in the “good and righteous God followers” column or category. And they would have grown up in a world that talked about the “Day of the Lord” (the coming of God) as a good day for the righteous but an awful terrible day for sinners, gentiles, and the unrighteous. The Old Testament says if you are sinner, a gentile, or unrighteous that when God shows up it’s a day to be feared, it’s a dark day full of vengeance and punishment. So when Jesus shows up we shouldn’t jump to the conclusion that for the disciples this was instantly good. They were filled with fear, and shame and most likely didn’t think of themselves as “righteous and good”. They would be wondering if Jesus is here to settle accounts, to bring rightly deserved punishment, to bring vengeance and sentence. And its into this highly charged, tense filled silence – where the disciples worst fears are playing with their imaginations – where shame is leading their souls further from God – that Jesus speaks some of the most beautiful words ever: peace be with you. Peace be with you. Peace be with you. Peace to your sins. Peace to your shame. Peace to your betrayal. Peace to your disappointment. Peace to your fear. Jesus shows up and gives out radical peace and forgiveness to a group of men who didn’t deserve it. Jesus first words are about peace, not judgment. This is a beautiful radical thing that we need to get. Jesus here is not just saying a short hello, or a salutation – Jesus is revealing the heart of God as about peace. Jesus is giving the trajectory of his kingdom that it will be about peace and not punishment and vengeance. God’s heart is about peace. This is a radically freeing three words. Because then God isn’t to be feared, God is to be embraced. Some of us believe that when Jesus shows up it will be to punish us for sins. But that’s not what this passage reveals. Jesus wants to free us from sin, not to punish us for sin. He has already taken all the punishment. And he wants to free us by offering us his peace. And that’s a good way to end, and to begin – with the peace Jesus wants to give us all. The disciples are not sure Jesus showing up is a good thing. Jesus is saving the world, and creating the world in this moment through peace. Fear and shame have no part of God’s Kingdom. Peace rules in God’s Kingdom. 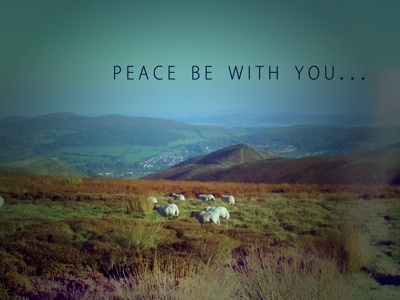 Peace be with you, because I am with you – Jesus. What stuck out to you from the sermon? What was challenging to you? How did God speak to you through it? What was new? Have you ever thought about how the disciples would have been feeling? Do you think they might have been fearful of Jesus? Have you ever been fearful of God? Why are Jesus words “peace be with you” meaningful for you? Who should you share Jesus words with? Who needs to hear them? Why not actually practice this passage today with your kids. Ask them if they have any worry, any fear, any shame or guilt or hurt. Talk to them, and then talk to them about Jesus gives us peace. Share his words with them, and have them repeat them with you. Share the peace of Jesus with your kids – that’s a good way to start.